A new species of Thismia (Thismiaceae) from northwest Borneo is described and illustrated. Thismia brunneomitra was discovered in 2015 in lowland mixed dipterocarp forest in the Ulu Temburong National Park, Temburong district of Brunei Darussalam. 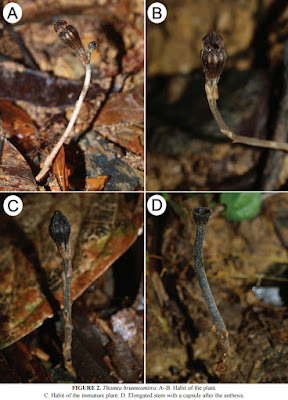 The new species is characterized by brown to blackish flowers with twelve darker vertical stripes on the perianth tube, inner tepal lobes that are connate to form a mitre with three very short processes at the apex, three-toothed apical margin of the connective and large wing-like appendage of the connective. An updated determination key of Thismia species found in Borneo is included. Primary tropical rainforests of Borneo are one of the most species-rich ecosystems in one of the world’s biodiversity hotspots (Myers et al. 2000). The island harbours some 15,000 vascular plant species in an area of 743,330 sq.km, of which ca. 37% are endemic (Raes et al. 2009). The lowland mixed dipterocarp forest represents the dominant natural forest habitat in Borneo (Primack & Corlett 2005). Unfortunately, these forests are threatened by large-scale timber extraction, as they contain several economically important tree species (Bryan et al. 2013). Thus, a combination of unique biodiversity and rapid deforestation has highlighted Borneo as a priority for nature conservation. One of the most intriguing inhabitants of the primary tropical forests of Borneo are small mycoheterotrophic herbs from the genus Thismia Griffith (1844: 221; Thismiaceae, or alternatively Burmanniaceae; for discussion see Merckx et al. 2006). Species of this genus are achlorophyllous plants with very specific and complex morphology. Currently, almost 60 species are recognized in the genus (Hroneš 2014, Hunt et al. 2014, Mar & Saunders 2015, Chantanaorrapint & Sridith 2015). Species of Thismia have scattered distribution through the (sub-)tropical areas of the Asia, Australia, New Zealand and South America (Jonker 1938, Maas et al. 1986, Hunt et al. 2014). Along with Thailand, Borneo represents one of the species diversity centres of the genus (Dančák et al. 2013, Chantanaorrapint et al. 2015). 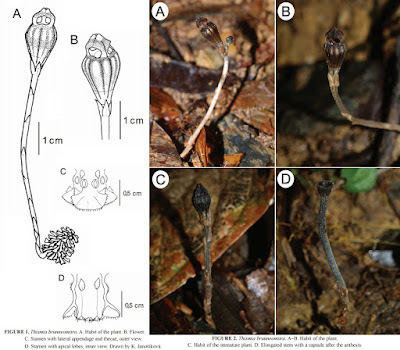 According to Jonker (1938), Bornean species with free perianth lobes and creeping rhizomes are treated as section Thismia, while species with connate perianth lobes forming mitre-like flowers and dense coralliform rhizomes are treated as section Sarcosiphon (Blume 1850: 65) Jonker (1938: 251). In Borneo, two species from this section are known: T. episcopalis (Beccari 1877: 250) F. Mueller (1891: 235) and T. goodii Kiew (1999: 179). During our recent expedition to Ulu Temburong in January and February 2015, we found a species of Thismia with fused tepals, which turned out to be another taxonomic novelty. This finding is only the second record of the family Thismiaceae for Brunei Darussalam (see Dančák et al. 2013). A–B. Habit of the plant. C. Habit of the immature plant. D. Elongated stem with a capsule after the anthesis. Habitat and ecology:— Shaded understory of lowland mixed dipterocarp forest. The only known site is in a ravine of a small stream. The terrain is steep, rocky and somewhat disturbed, with patches of bare mineral soil. Plants were found primarily in these bare patches with several individuals growing on a rock crevice just next to the stream in association with Diplazium cordifolium Blume (1828: 190), Epipremnum falcifolium Engler (1898: 11), Mapania monostachya Uittien (1935: 194), Schismatoglottis asperata Engler (1879: 297) and Selaginella involvens agg. Several other mycoheterotrophic species were recorded around, within a distance of 5 m: Epirixanthes elongata Blume (1823: 82), E. papuana J.J.Smith (1912: 486), Sciaphila densiflora Schlechter (1912: 87), S. secundiflora Thwaites ex Bentham (1855: 10) and Gymnosiphon aphyllus agg. Distribution:— Thismia brunneomitra was found near the Kuala Belalong Field Studies Centre in the Temburong district of Brunei Darussalam. The only known population occurs on the right bank of the small stream Sungai Mata Ikan, approximately 100 m from its confluence with the Belalong River and near the “Ashton trail” forest circuit. Conservation status:— Population of T. brunneomitra occurs within the designated research zone of Ulu Temburong National Park, to which public access is restricted. The type locality and its surroundings are thus protected from logging or other destructive anthropogenic activities. However, given that after a thorough search, no more than 15 individuals were noticed, and that the population is situated near relatively frequented forest trail, we suggest evaluating the species as critically endangered (CR) according to the IUCN Red List Categories and Criteria (IUCN 2012). Etymology:— Name of the species is composed from Latin words brunneus (brown) and Greek mitra, referring to the typical colour and shape of the flowers.